King of Tokyo: Cthulhu Monster Pack is an expansion for King of Tokyo and King of New York by Richard Garfield, published by IELLO. It is for 2-6 players. This expansion adds a new playable character including board and figure, as well as tokens and Evolution cards for both games. For more information on King of Tokyo and how to play it, please follow the link below. The rules for both games remain the same, so I won’t go into details about that. Instead I’ll explain what this character expansion brings to the table and how each piece works. During setup, this character can be chosen to play as. However, there are a few things that need to be mentioned. Included with this expansion are several double sided tiles. One side has a Cultist on it, while the other has a Temple of Cthulhu. The Cultist tiles can be used even if no one chooses to play as Cthulhu. Likewise, you can play as Cthulhu without using the Cultist tiles. However, if a player chooses to use Cthulhu’s Evolution cards, then the Cultist tiles must also be used. When playing King of Tokyo, the Temple of Cthulhu side of the tiles are not used. However when playing King of New York, both sides of the tiles are used. Let me explain how these are used in each game. First, let’s discuss King of Tokyo. When playing this game, the Cultist tiles are placed next to the board in a face up stack. On a player’s turn, when they resolve their dice if they have 4 identical faces showing, they’re allowed to take a Cultist tile and place it in front of themself. The tile can be used at any time by simply discarding the tile. When this is done, the player chooses to either gain 1 health, 1 energy or 1 extra roll. Next, there’s King of New York. When playing this game, the Cultist tiles are shuffled in with the building tiles from the base game. Stacks are formed with 4 tiles in each, building side up. 3 stacks are placed in each of the boroughs of New York just like normal. The Temples act just like a normal building in the game. Once it’s destroyed, it’s turned over to it’s Cultist side, which acts just like a unit from the base game. When a Cultist is destroyed, nothing is gained. Instead, the player takes the Cultist tile and places it in front of themself. Just like when playing King of Tokyo, the tile can be discarded to gain either 1 health, 1 energy or 1 extra roll. For both games, Evolutions act exactly the same. Of course they both require the use of the corresponding Power Up! expansion though. While were on the subject of Evolutions, one last thing I haven’t mentioned are the Madness tokens. These are given to other monsters due to some of Cthulhu’s Evolution cards. Let me explain how they work. At the beginning of a player’s turn, they must roll as many dice as they have Madness tokens. Once rolled, the dice are set aside and may not be rerolled. Effectively, they are locked. The player then rolls the rest of their dice and can set aside or reroll them like normal. When a player chooses to resolve their dice, the locked dice are resolved as well. To get rid of a Madness token, the player simply uses a heart icon on a rolled die to discard it, instead of gaining 1 health. If you like the new updated version of King of Tokyo, then you’ll love this too. 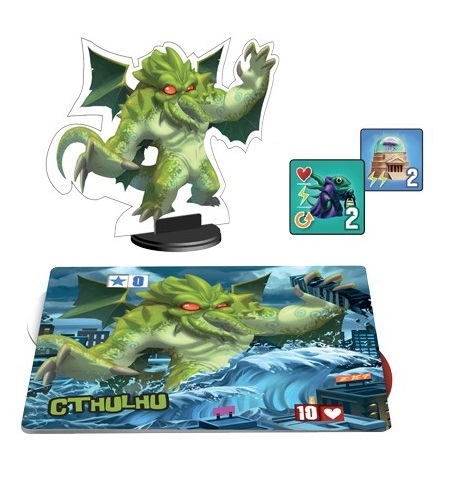 This expansion comes with a monster board and figure of Cthulhu as well as a plastic stand to help him rule over either Tokyo or New York. The artwork on these is very much reminiscent of the new versions. There are also double sided tiles of Cultists and the Temple of Cthulhu. There are several different styles of temples. Even though they could have simply went with 1 design, IELLO chose to go a step further which I felt was a nice touch. I have to say, I really like the look of the little Deep Ones on the Cultist side of the tiles. It looks like they could summon up the Ancient One at any minute. Also included are the Madness tokens which show the eyes of Cthulhu. I wouldn’t recommend that you stare for very long or you might lose your grip on sanity. All of these items are thick cardboard which is completely identical in size and durability as those of King of Tokyo. The last pieces are the Evolution cards for King of Tokyo and King of New York. There are 8 cards for each game which are easily distinguished by the backs. These have the same look and feel as those of the other games. Overall, I really love the look of everything that’s included. I couldn’t have asked for anything better looking. For the rulebook, all that was included was a small double sided page of rules. One side explains the Madness tokens and Evolutions, while the other gives you the rules for playing in Tokyo or New York. Even though the page is quite small, they included a couple of small pictures of the tiles for reference. No examples of gameplay included on the rule sheet, but they weren’t needed anyway. However there is a small section of new icons that show up in this expansion. Overall, there’s nothing difficult to understand. It’s a quick and easy read. I wouldn’t add anything else. It gets the job done very well. It’s not a secret that I LOVE King of Tokyo and King of New York. What might be a secret is my love for all things Lovecraftian, especially those things that involve the sanity destroying Cthulhu. When I first reviewed the updated version of King of Tokyo, I was quite sad that my favorite monster, the Kraken, had disappeared. I had always thought of him as a surrogate Cthulhu when I played the original. You can imagine my moment of excitement when this guy showed up on my doorstep ready to destroy those other pathetic excuses for monsters. I have to say that I really love the look and feel of the expansion. I’m also overjoyed that not only can he destroy Tokyo, but also New York as well. I love the Cultist tiles. They’re great for when you need a quick point of health or when you’ve almost got enough to get that power card that you desperately want. I especially like that Cthulhu can use Evolutions to create Madness in his opponents. Nothing like locking up another person’s dice to drive them slowly insane. Fans of either Tokyo or New York , will absolutely love having this guy as a part of the game, especially those with an affinity for the Cthulhu mythos and HP Lovecraft. This monster pack has just made my love for the game even greater, if that were humanly possible. Having an actual version of Cthulhu to play as, I completely forgive IELLO for taking away my Kraken. It was worth the wait. I highly, highly recommend this expansion! 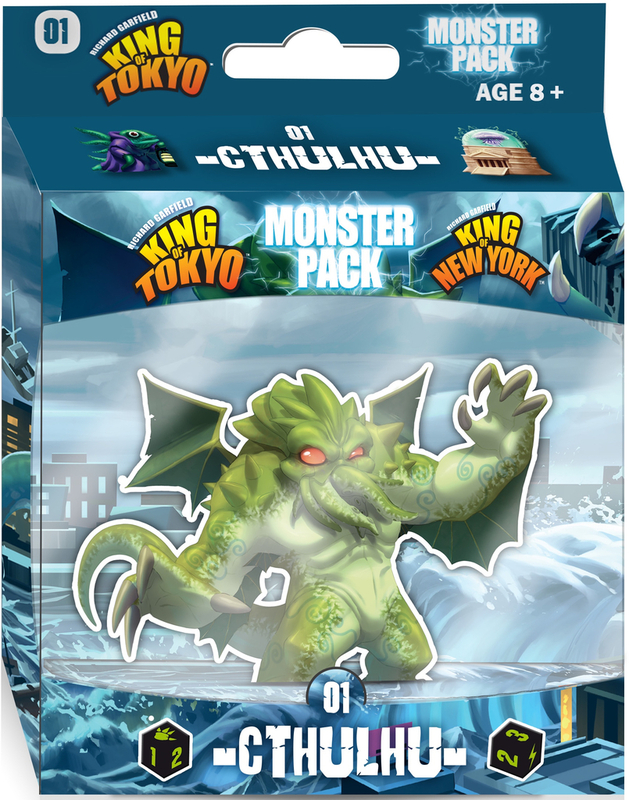 King of Tokyo: Cthulhu Monster Pack is an expansion for both King of Tokyo and King of New York. Since this adds a new character and not really a whole lot more, there’s absolutely no real difference in terms of length of game. The components look great. I absolutely love how easily the design fits in with the updated version of King of Tokyo and King of New York. I really like the tokens and tiles for this one, as well as the standee and monster board. Heck, I like everything! Fans of either King of Tokyo or New York will love this, especially fans of HP Lovecraft. It’s a great addition to the game. I HIGHLY recommend it. It’s a definite MUST have. At this point, the question you should be asking yourself is, “Why haven’t I already bought this?”. This entry was posted in Reviews and tagged board, board games, card, card games, cthulhu, games, garfield, iello, iello games, king, king of new york, king of tokyo, monster, monster pack, new, pack, richard, richard garfield, tokyo, york. Bookmark the permalink.